Dams are structures built in a river valley that retain a certain volume of water by obstructing the natural flow of the river’s water. There are two large families of dam, those built of concrete and those built of earth or coarse rock. This sheet describes the coarse rock or fill dams only, as concrete dams are less frequent and above all involve very large capacity impounding reservoirs. Backfill dams are made up of a loose material, be it very fine (clay) or very coarse (coarse rock). The family does however have several categories. The differences come from types of material and the method used for sealing purposes. 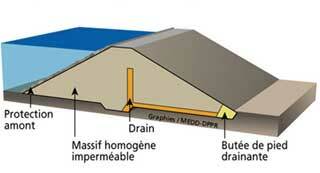 - The homogeneous dam is a fill dam built with a sufficiently sealing material (clay, silt). This is the oldest technique for fill dams. the shell materials are stronger than the clay materials ; stiffer banks can therefore be constructed and the flows percolating in the body of the dam are controlled better. - Faced dams are sealed by a "face" on the upstream wall of the dam. This "face" can be in reinforced concrete, bituminous concrete or a thin membrane (usually PVC or bituminous membranes). This method has been widespread throughout the world for centuries as the population has always needed a water reserve available for its domestic and farming needs. 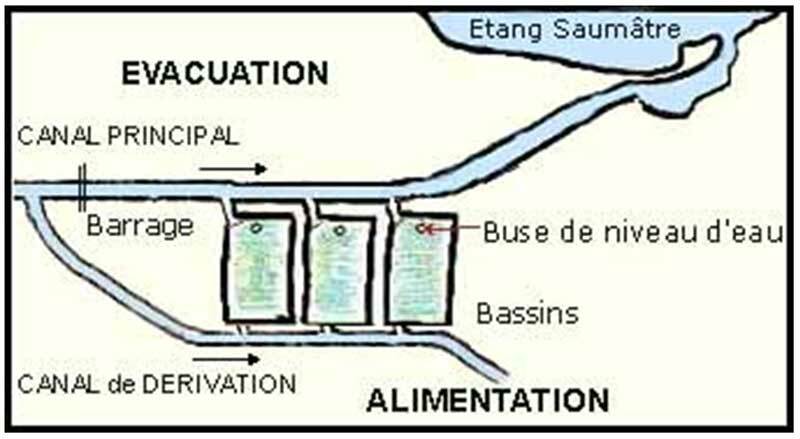 Small dams can be built by the villages themselves with the assistance of technical services, NGOs or other bodies such as IOWater and the Réseau RéFEA, which has produced for this purpose interesting practical sheets on construction techniques for small earth dams (access link at the end of the sheet). These dams can also have multiple uses and encourage the development of small revenues. It is clear from the previous example that building a dam can create reservoirs of better quality water than found in retentions that are often brackish and dirty. Water quality is taken into account better and stocks thus formed are monitored better. More generally, dams can store the water brought by the rivers during rainy periods and thus make a water reserve available during low water. 4) Who is primarily concerned ? Anybody living near a steep-sided location who needs to build up water reserves for mainly agricultural (irrigated farming, watering animals) as well as domestic use. Large dams can also sometimes supply hydropower plants. 5) What does this process involve ? How is it applied ? The best place is where the valley narrows. The valley must open out with a gentle slope upstream from the narrows to allow the largest volume to be stored. The dyke is therefore smaller and therefore cheaper. Due to the risk of the dam bursting and the potentially catastrophic consequences, it is mandatory to carry out reliable preliminary studies fully and rigorously. These studies cover the topography, geology, geotechnics, hydrology and the environmental impact. - The rock above the depression must be preferably large and form a funnel going towards the depression so that the water can drain into it. - Simple stone and mortar troughs can be extended from the ends of the dam, rising above and across the rock to channel the flow from a wider area and bring it down towards the dam. 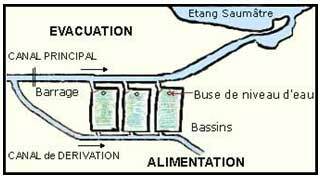 - The dam site and the bottom of the reservoir must have cracks or rocky fractures that risk draining the water far from the site. - The dams must be located along the edges of depressions or directly in the lowest parts of large plains, in the rock. The volume of the impounding reservoir must be equal to the sum of water needs and losses. The needs to be satisfied must therefore be assessed (domestic, agricultural and other), along with the inputs (volume of water flowing in the water course) and the losses. The impounding reservoir capacity is determined using level curves plotted from preliminary topographical surveys. Having chosen the site, the centreline is identified with the concrete markers installed at each end. These markers continue to serve throughout the work and must not be moved. Stakes are planted at regular intervals between the aligned markers. This survey is used to determine the height of fill at each point, the width of the dyke at the base and the volume of backfill. The coffer dam is a temporary dam built upstream of the site to protect the work area from flooding. 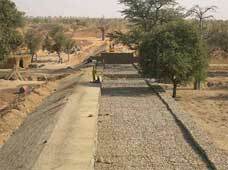 The coffer dam is not necessary if the work is carried out entirely during the dry season. The water stored by the coffer dam can be used for the work (compacting) and possibly for mixing the concrete. For the rocky foundations, the contact surface between the rock and the fill must be as impermeable as the rest of the fill. Smooth surfaces and unplugged cracks must be avoided. The topsoil and the spoiled rock must be removed with a shovel, pickaxe or crowbar and removed from the site. For the coarse foundations, the dyke centreline is stripped until a clean surface area free of all plant matter is obtained. If the foundations are permeable, a sealing shield is created as far as the rock (or the impermeable soil). The materials are transported, deposited and spread to achieve the required thickness. If the natural material does not have the necessary water content for good company, it is moistened either at the borrow pit or after spreading using a tank fitted with a sprinkler tube. Compacting machinery completes the process. Layer thicknesses and the number of machinery passes are determined by a test area on the site. The dyke is built 20 to 40 cm wide so that banks can be well compacted ; these are then cut to the required slope. When the dyke has been completely backfilled, a fill height is added of about 5% of the height of the dam to cover future settling. planting trees and by plugging small streams. Dams are essential infrastructures so that populations can live and not join the rural exodus. Once the basin is filled with water, the dam can be used directly to irrigate land thanks to simple partial emptying systems. 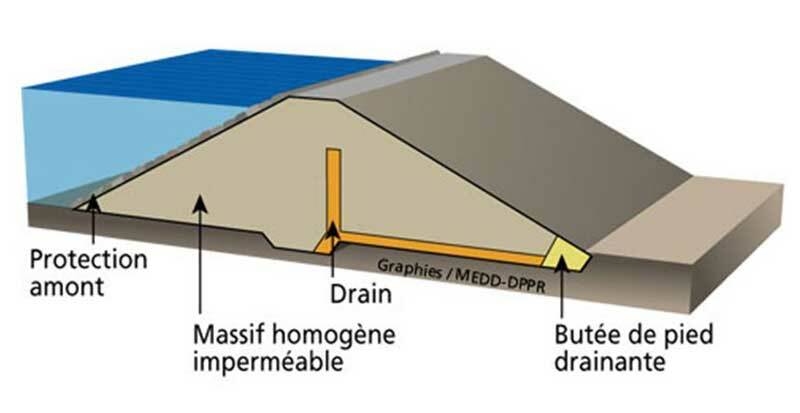 Dams can also improve the infiltration of water into the water tables. Their construction often gives rise to many small local development programmes. These systems require the introduction of collective public or community management to ensure fair access to water for all and to avoid disputes. The major drawback continues to be the varying degrees of water lost through evaporation and infiltration, which in some cases can result in a preference for building underground dams (see sheet E8). Another sometimes significant drawback : if the preliminary studies are not well done or do not take account sufficiently of potentially important secondary effects on the local populations, the environment, the drop in quality of farmland or fishing possibilities downstream from the dam, the result can prove disastrous for the local populations, mainly for example in the case of large dams where they gain virtually nothing. All this contributes to inciting lively debates on the advantages of constructing dams. Small earthen dams, where the semi-circular or curved earth dykes are frequently under 3 m high and 60 m long, are normally built by hand and using animal traction. They can normally be serviced and repaired by the community that uses them. The cost is therefore low but obviously depends on the configuration and the type of position, dimensions and the cost of materials. Large earthen dams usually need powerful earthwork machinery and huge investment. The Tagant in the south of Mauritania is an oasis area and a transition area between the Sahara and the Sahel. The Rainfed Area Development Project (PARP), financed by European cooperation to the tune of 6.2 million euros, was intended to encourage the control of water by building dams that allowed flooded lands to be farmed in order to fight against the drop in living standards of farmers and herders and fix the populations or allow them to return to their region of origin. These huge sites were supported by a multitude of actions more targeted towards inhabitants. Thus were born the improvement programmes for farm production in bowls, distribution of butane to replace heating wood and coal, support for marketing gardening cooperatives through extension of techniques or installing irrigation infrastructures, developing cereal banks, installing solar panels for water pumping, constructing mills, wells, classrooms, etc. The combined effects of dams and the many microprojects that have seen the light of day have gradually revitalised life in the country’s rural areas. The opening up of these regions nevertheless continues to slow down their development substantially. The inhabitants are now patiently waiting for the roads and tracks which already have financing in place.